I finally did it. I bought my first sewing machine. I have been borrowing my mother’s for awhile, but it never really helps me learn. Her Singer is old & I end breaking the thread constantly; plus, many of its stitches do not work. My mother hangs around, nervously watching me & almost always takes the work and finishes it for me. My mom does beautiful work, but I need to learn on my own. 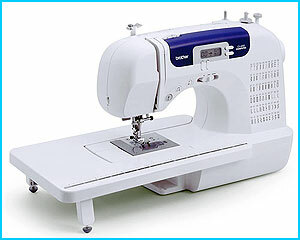 101 Stitches, 7 styles of one-step, auto-size buttonholes, one-step bobbin replacement with quick set drop-in bobbin, automatic needle threading, an oversized table for large sewing and quilting projects, & a LED display with computerized stitch selection. Now I can really get into that Friendship Quilt Swap that I’ve joined! I’m so excited!